It’s minutes before the curtain is set to rise for this year’s production of the Black History Month play at Henderson Inclusion Elementary School on a late February morning. Students are excitedly tending to last-minute costume fixes and teachers are busy issuing their last tidbits of advice. But there’s one teacher here who’s clearly in charge: the play’s director, Darlene Jones-Inge. 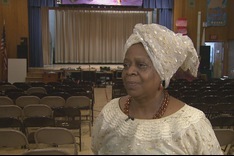 She’s been a special education teacher for more than three decades. At Henderson, she works side-by-side with her partner general education teacher. Their elementary school in Dorchester, Mass., is unique. A third of the students have learning issues, and they’re educated in the same classroom as students who don’t. And the arts are an important part of engaging Henderson’s diverse student body. According to the National Center for Learning Disabilities, the arts require complex thinking and problem-solving while engaging students in different ways. For example, dance and music require complex thinking, but most students also find them fun. “I don’t think you can find any better means to attract children than the arts — whether it’s singing or learning an instrument or painting a picture,” Jones-Inge said. Many students with learning issues lack confidence in some of the typical classroom activities but shine in the arts. One of Henderson’s fifth graders with severe dyslexia relies on an iPad audio program for reading in the classroom, but she transforms into a star on the stage, dancing to the beat and singing in perfect pitch. The positive feedback she received from her performance will go a long way to boost her confidence in the classroom. And although the excitement surrounding this play would have you believe otherwise, this performance is not a once-a-year event. “If were doing something on Native-American history, the art teacher makes sure that there’s Native American art involved, the dance teacher makes sure that they may learn some tribal dancing, and our music teacher enhances it with music, traditional music,” she said. A Henderson Inclusion Elementary School student’s project on display in the auditorium. In a report on Wednesday’s NewsHour broadcast, health correspondent Betty Ann Bowser traveled to Boston to learn more about the role of learning issues in the American dropout crisis. Click here for a primer on the set of disorders. Then read the profiles of two young men — a poet-businessman and a Harvard graduate student — who transformed their learning issues into stunning success stories. Finally, read six tips for parents of students with learning issues here.